We are a friendly landscape company with over 10 years experience working in the Derby area. We have vast experience in laying patio’s and garden paths. We offer a wide range of ideas for decking whether small or big, all decking is laid on suitable frame work. We can advise and offer a free quotation. We can lay many different types of lawn / turf. We also have many years experience in the most efficient way to remove weed so it does not repopulate. At T&L we can build any kind of garden wall, from standard to a more decorative walling stone. Will a plethora of experience; we get the job done right, first time. We supply and install every kind of fencing and styles. We also erect various styles of gates to match your requirements. We are a friendly, run landscape company with over 10 years experience working in the Derby area. 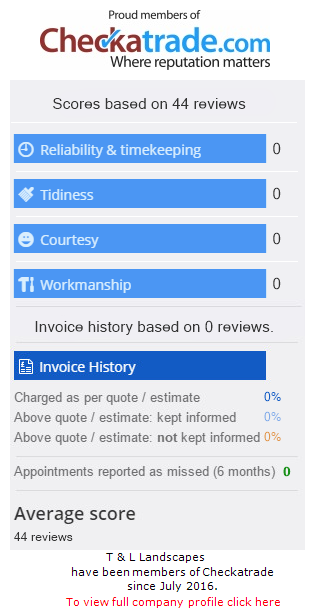 We have developed a first class reputation for a reliable and professional landscaping service. We undertake all aspects of work from patio’s, fencing, garden walls, decking, lawn treatment, plus more.